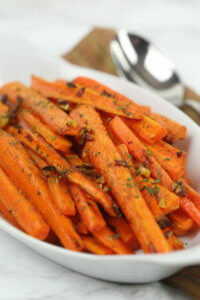 Cut carrots into matchstick sized pieces and arrange on foil lined baking sheet. Place butter in a microwave safe bowl; add garlic. Microwave butter and garlic for 30 seconds, or until butter is completely melted. Pour melted butter and garlic over carrots. Add House Seasoning Blend; toss to coat. Roast for 25 minutes or until carrots are tender and slightly golden.